A Medium Size, Well Made Pelican Point That Exhibits Surface Coloration And Stone Aging Patination, Correct Rolled Basal Stem Edge Hafting Dulling, Correct Blade Sharpening Use Reduction, Correct Basal Thinning, Deep Hinge Staining, Correct Type Material And Manufacture For The Area Found. Found By Roy Lynn Hutchinson, Near The Sunk Boat Hunting Club At The Black River. 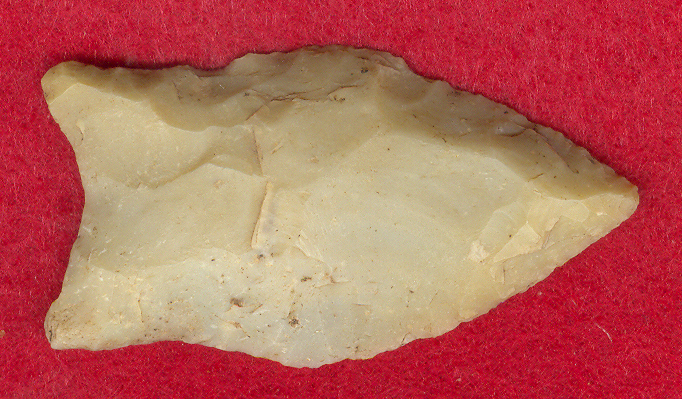 This Is An Early Period Artifact, Displaying Ancient Blade Sharpening Use Wear, Being In Good Condition! Includes A Ken Partain Certificate Of Authenticity!